The newest model from Cruisers Yachts also marks the 60 Fly as the flagship for the company. Offering unprecedented views for piloting from the flybridge, its packed with a spacious helm and lounge – complete with wet bar – for entertaining up above. 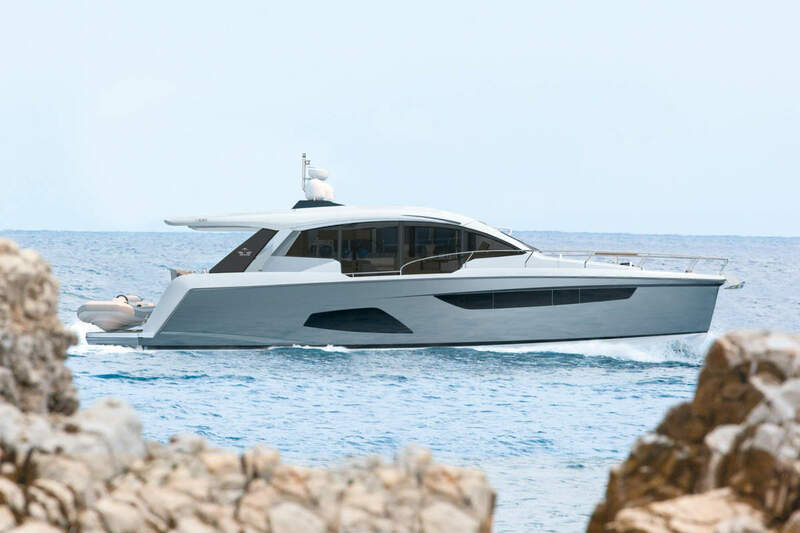 The 60 Fly also features a sleek hardtop for shade and protection from the elements and is wrapped in levels of comfort expected from the brand. the WSB team take a close look at the new arrival. The creation of a new Riva boat always sets a challenge to state-of-the-art yachting, with such a historic brand name and expectations that come with that, Riva sets its sites high with every new addition to its range. 56’ Rivale, the masterpiece which further expands the open yacht fleet, was presented to the world on 10th June during “Reflection”, a magnificent event celebrating the timeless elegance of Riva in the place where the legend was born 175 years ago: the historic Sarnico shipyard. The WSB team was happy to join this special occasion to take a closer look at the Rivale. The Prestige 630 is instantly recognized by her well-balanced exterior design and contemporary lines. The 630 is a Garroni Premorel concept and a trusted Prestige partner, which through great design has ensured a thoughtful uninterrupted hull-side window layout, that floods the accommodation level with light, and provides a great sea view from each stateroom. So the WSB team took the chance to check out more on the new 630. RIO YACHTS celebrate the launch of the new “COLORADO 44”. It is an important year for the boatyard from Bergamo, as it celebrates its 55 years of activity: a milestone that brings back memories of 1961, the year of RIO’s foundation, the dawn of boating, when power boats, with Chris Craft and Rolls-Royce engines, were made from mahogany by master wood craftsmen. The WSB team get up close to the 44, to check out the new arrival. The Ferretti Yachts 850 is an icon of luxury, offering the unique experience of life in a magnificent maxi loft surrounded by the sea, and it’s just the latest extraordinary masterpiece in the history of a brand that goes back almost fifty years and has won the approval of the main international markets. So, it is no surprise that three of the new yachts have already been sold, two in Europe and one in the Americas: proof that it is already an unmitigated success.